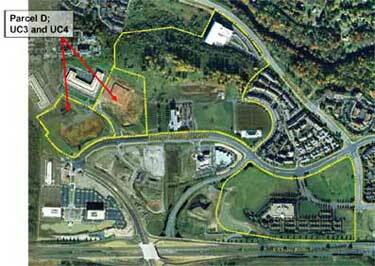 GW recently purchased land adjacent to the existing Virginia Science & Technology Campus. The arrows indicate the new acquisition. The campus continues to experience growth of its academic programs, expanding its focus from graduate education to a broader set of offerings including certificates, specialized undergraduate, master’s and doctoral programs in education, engineering, business, nursing and health sciences. Currently, the VSTC is also home to 17 research laboratories and distinctive centers of excellence focusing on areas such as transportation safety, high performance computing, and sustainable energy. The campus provides educational and research opportunities for more than 600 students and is also the location of a variety of administrative departments, with a total of approximately 425 GW faculty and staff assigned to the campus. The university is committed to the growth of the VSTC and envisions the campus as a unique opportunity for the development of innovative research centers, educational programs and corporate partnerships at this strategic position in the Northern Virginia technology corridor. GW has also invested in its physical presence at the VSTC. This year, GW acquired approximately 22.5 acres of land adjacent to the existing campus at the main entrance to University Center (as illustrated in the picture), highlighting its commitment to the long-term potential for additional facilities on this campus. With this new acquisition, the VSTC campus now totals approximately 120 acres. Museum Conservation and Resource Center & Academic Incubation Facility: The Museum Conservation and Resource Center and Academic Incubation Facility, located at the intersection of Presidential Drive and George Washington Boulevard, will feature a 22,000 square foot museum conservation and art storage facility for the George Washington University Museum and approximately 30,000 square feet of space for future academic and research programs. The conservation facility will support the new GW Museum, to be located on GW’s Foggy Bottom Campus. The Museum will house the university’s own collections; those of the Textile Museum, which entered into a partnership with the university last year; and the Albert H. Small Washingtonian Collection, an unparalleled compilation of more than 600 maps, prints and other documents related to Washington, D.C.’s, history as the capital city. The Textile Museum’s collection includes more than 19,000 objects, including carpets and rugs from Egypt, Spain and central Asia; a group of 17th-century Caucasian dragon carpets and fragments that is one of the world’s best outside of Turkey; an extensive collection of pre-Columbian Peruvian textiles, early Islamic textiles; and many other examples from China, Japan and Africa. The building, currently under design and anticipated for late 2013 completion, will have a groundbreaking ceremony in November. Simulation and Skills Lab: The School of Nursing has added an additional 3,300 square feet to its Simulation and Skills Lab in Innovation Hall. The new facility, which opened for the fall 2012 class, includes an eight bed hospital ward, two private rooms and a studio apartment dedicated to in-home care. The state-of-the art video capabilities allow for enhanced training and monitoring of students using the latest in video and voice capture technology. Solar Walk: A landscaped pedestrian sidewalk that demonstrates solar technologies is complete. The Solar Walk links Exploration and Innovation Halls and extends the public sidewalk to the intersection of GW Boulevard and University Drive. The walk features a trellis with solar panels that supplements electricity for lighting, and a test installation of ‘walkable’ solar panels is also being pursued as an additional solar element. Comprehensive Signage Package: In summer 2012, the university completed initial design of a campus-wide signage package to provide a consistent identity for the campus and improve way finding and visibility. This package is currently under review by Loudoun County. 45155 Research Place: In spring 2012, GW relocated certain administrative functions from Enterprise Hall to newly constructed office space at 45155 Research Place. This relocation frees up space in Enterprise Hall for future academic and programmatic uses. Now the majority owner in this office condo, GW has approximately 200 administrative staff working in this location. GW has also added an intercampus shuttle stop at this building and nearly one-half mile of sidewalk for pedestrian traffic between Research Place and Enterprise Hall. Exploration Hall: In 1991, with a gift of 50 acres from Robert H. Smith, then president of Charles E. Smith Construction, Inc., the GW Virginia Science and Technology Campus opened its first building, a 77,000 sq. ft. research and education facility. In 2001, a National Science Foundation grant added 1,300 sq. ft. to the building to house one of the largest earthquake simulators on the East Coast. Enterprise Hall: In 2002, the university purchased a 204,000 square-foot facility situated on 40 acres fronting Route 7, adjacent to the original 50 acres. The renovated building opened in 2003 and now houses classrooms, the Virginia Campus Library, the Colonial Cafe, offices for academic programs, The JASON Project, IJIS, approximately 200 administrative staff, and GW’s main data center. National Transportation Safety Board: In 2003, the university completed the 86,000 square-foot facility leased by the National Transportation Safety Board as its investigation training facility which includes state of the art classrooms, laboratories, an outside simulation court for accident reconstructions, and other equipment used in training accident investigators. Innovation Hall: In December 2008, GW purchased a 71,000 square-foot building adjacent to Exploration Hall. The building is occupied by the offices of academic administration, the National Crash Analysis Center (NCAC), the administrative offices of the GW Online High School, the School of Nursing, Health Sciences academic program offices, and high tech classrooms. 45155 Research Place: In spring 2012, GW relocated certain administrative functions from Enterprise Hall to newly constructed office space at 45155 Research Place. This relocation frees up space in Enterprise Hall for future academic and programmatic uses. Now the majority owner in this office condo, GW has approximately 200 administrative staff working in this location.